The cross-party consensus favours massive public spending cuts. 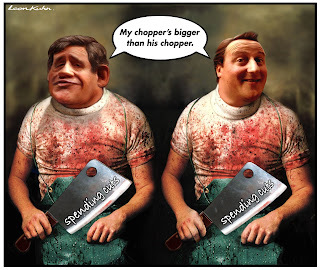 Cameron promises that such cuts will be "painful", though "savage" is the word preferred by Nick Clegg. I won't bore you with whatever Brown said, as he's yesterday's man. The question is why? We are told that it is because of the budget deficit, and a great deal of the commentariat has been going along with this idea. Yet not everyone is persuaded. The right-wing economic commentator Samuel Brittan has pointed out that public debts have been much higher before, in more prosperous periods, and bankruptcy has not resulted. Instead, debt was gradually managed down without any extraordinary gestures. Brittan remarks: "If we have a normal economic recovery the red ink will diminish remarkably quickly. If we don’t, it won’t and won’t need to." Johann Hari gets in on the same act today, pointing out that the most successful economies in the world have been in far higher levels of debt than are projected for the UK, for several decades. What the likely next government is promising to do is raise the retirement age, so that people aged 65 have to work for another year, or claim benefits at a rate well below what their pension entitlement would have provided. This brings forward plans already outlined by New Labour, which weren't supposed to come into effect for a decade. More people on incapacity benefits will be forced onto Job Seekers Allowance too, thus costing them £25 a week. Companies will be paid to 'employ' people on benefits, though they will not be expected to pay them a wage - again, a Tory version of something New Labour has already contemplated. And public sector workers can expect pay freezes which, in real terms, amount to pay cuts. In general, if Brittan's analysis of the statistics holds, then we're talking about an average of 3% cuts across all departments on the basis of current Tory plans. That's probably going to involve a lot of privatization, with Royal Mail in the frontline. The cumulative effect of all this will be to reduce aggregate demand at a time when the economy is still weak and susceptible to sudden collapse; reduce employment at a time when unemployment is already soaring; and, ironically, probably increase the cost of labour in the long-term by driving up the costs of previously cheap, socialised services. In a particular light, this doesn't even work by capitalist standards. Even the CBI is deeply dubious about this whole business of rapid, savage cuts, not least because the public sector is one of the big customers for the private sector. So, what is going on? The centre-left criticisms rightly focus on the threat of the Tories, but they are just the most aggressive exponents of the slash-and-burn doctrine. What accounts for this extraordinary cross-party consensus on spending cuts and privatization? The answer can only be that the deficit is a pretext for other priorities. All three parties are committed to removing whatever blockages there are for capital accumulation in the UK, to make it more competitive and more powerful in the world system. The growth formula to which they still cleave says that a low-tax, low-wage economy produces more investment, more jobs, higher growth and ultimately more revenues for the state. That means a shared commitment to reducing spending on pensions and welfare, for which purpose successful businessmen like David Freud have been recruited. It means a shared belief that the private sector should take on as any of the traditional roles of the public sector as possible - and, indeed, such accumulation-by-dispossession does provide opportunities for profitable investment. It matters less what the parties' ultimate goals are in this respect than that they are all committed to a healthy capitalist economy, and all accept the received wisdom of neoliberalism. Take the issue of industrial relations. We are about to hear a lot of moral blackmail on this question, as the postal workers' strike will be used to show that strong trade unions frustrate necessary reforms, and cause businesses to retain outmoded and inefficient practises. We will be told that unions erode price competitiveness and discourage investment, and that if the more recalcitrant elements of the labour movement can be broken, then the more 'sensible' trade unions can be integrated into a new model in which they help facilitate reforms and increased labour productivity, smoothing out differences between workers and management rather than waging class struggle. That, the Tories will say, should lead to resumed growth with low inflation and more foreign direct investment. (This isn't actually true, of course - see David Coates' Models of Capitalism for a survey of the evidence). All of the terrifying stories about 'bankrupt Britain' give this neoliberal narrative some much needed support. Even if big business is alarmed by the speed and savagery of proposed spending cuts, moreover, the overall approach is one which they applaud, as is evidenced by the CBI's demand that students should have to pay more to fund the education system. And perhaps there is an attempt to set the bar too high as far as cuts and rollbacks are concerned, so that there is less resistance and perhaps even some relief when the cuts turn out to be less immediately savage than was promised.